Here is the next installment of my Holiday Gift Guide series! 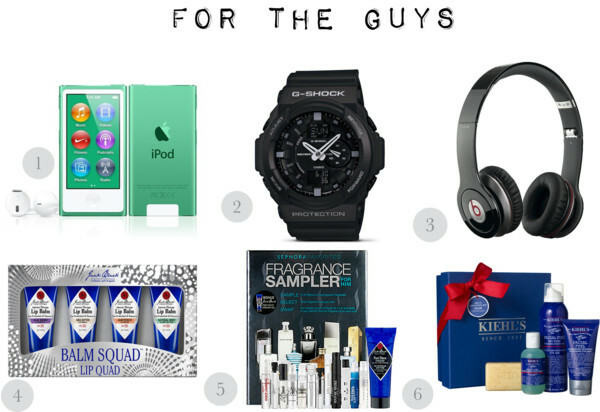 This time, I am going to be sharing gifting ideas for the special guys in your life. Let's get right into it! 1. iPod nano 16GB ($149.00): These new iPod nanos are modern, travel-friendly, contain a touch display, and they come in many different colors. This is an item that many are sure to love! 2. G-Shock New Concept Combination Watch ($130.00): A watch is a fashion accessory that will never go out of style. It's even nicer to have a watch that is so versatile like this G-shock one that I am featuring. This watch is sporty, but sophisticated at the same time because of it's classic, all black color. 3. Beats by Dr. Dre Solo HD Over-Ear Headphones ($199.99): Forget those small ear-bud headphones. These beats ones are sure to make one's sound experience much more pleasurable. They look super comfortable to sport, and they are travel friendly to boot (you can fold them to easily store them in your bag). 4. Jack Black Balm Squad Lip Quad ($25.00): These lip balms are sure to be a treat for dry and chapped lips, that the cold weather brings. They are super moisturizing and contain an SPF of 25, which makes these great lip protectors. 5. Sephora Fragrance Sampler For Him ($50.00): I know fragrances are such a personal thing and everyone has different tastes when it comes to them. Kits like this one from Sephora are pretty nice to gift, since they contain variety. I really like these Sephora fragrance sampler kits because, they contain vouchers that can be redeemed for a bigger size of one's favorite fragrance in the kit. Love that! 6. Kiehl's Men Refeuling Kit ($42.00): This gift set is perfect for the skincare-buff, who is always on the go. It includes a soap, moisture treatment, face wash, and foaming gel, all for a very reasonable price. I will be back soon with more Holiday gift guides! Have an awesome weekend, everyone!